For years, Mockingbird has been developing leaders, organizing advocacy campaigns, and changing both policies and practices impacting those who have experienced foster care and homelessness. During this time, we have developed an annual advocacy cycle that drives the process through statewide youth engagement. Identifying Challenges: Youth advocates brainstorm system gaps affecting youth and young adults experiencing foster care and/or homelessness. Activities include: (1) brainstorming ideas; (2) prioritizing issues; and (3) creating problem statements. 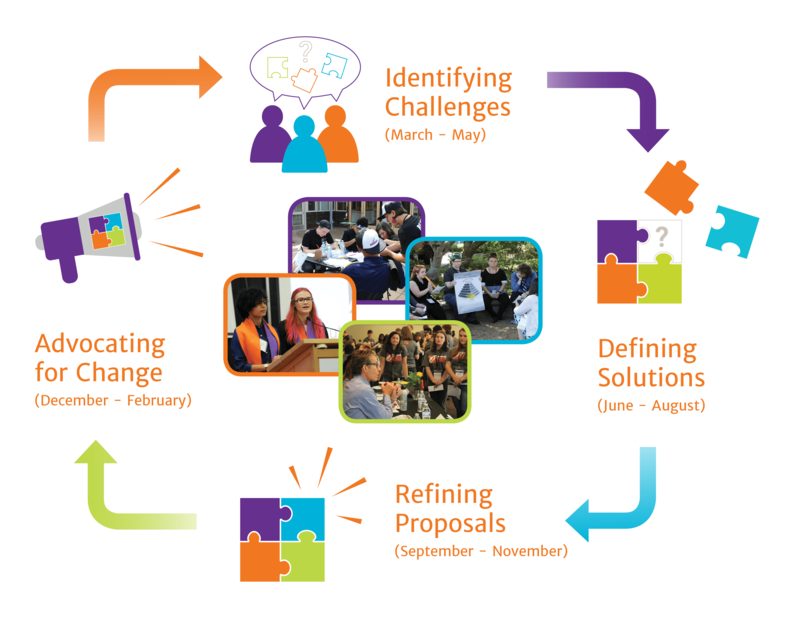 Defining Solutions: Regional chapters develop solutions to address system gaps. They announce preliminary policy recommendations at the annual Youth Leadership Summit. Activities include: (1) Voice Development training; (2) collaboration with community experts; and (3) the Youth Leadership Summit. Refining Proposals: Mockingbird youth advocates build support for policy recommendations with community leaders and policymakers. Activities include: (1) Power of Voting training; (2) Storytelling for Advocacy training; and (3) endorsement of policy agenda. Advocating For Change: Mockingbird raises awareness about its legislative agenda and mobilizes youth advocates. Activities include: (1) Youth Advocacy Day; (2) Legislative Advocacy training; and (3) legislative testimony and policy meetings.